Workout: Warm [1.5 mi. 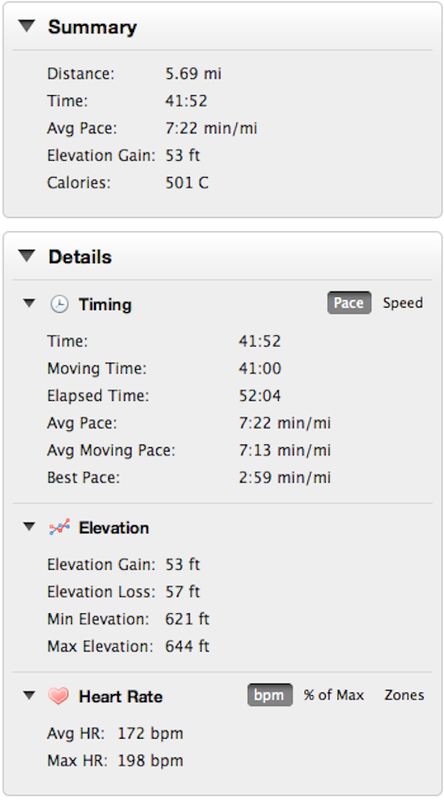 ], 3 miles @ 6:33 pace, Cool [1.5 mi.] Weather: 81 degrees, partly cloudy. Most important, today, it was the first time I finished the cool down and the drills portion of the workout on after a tempo run. This is important to me. 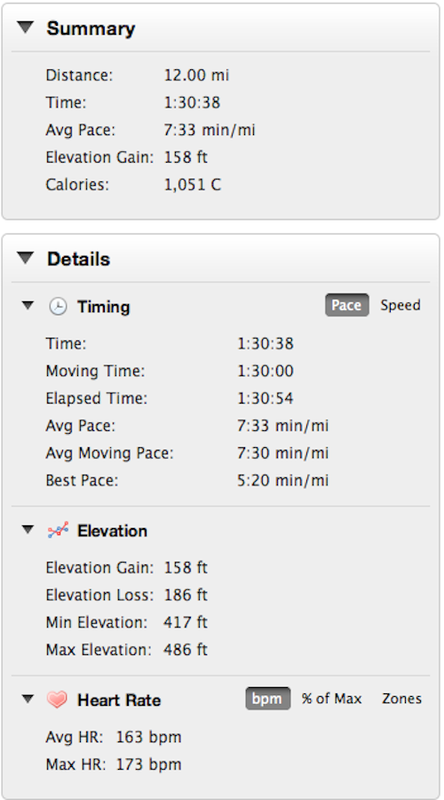 Unlike the SmartCoach Runners World plan, my plan does not call for increasing tempo run length. Instead, I will gradually increase both the distance and the pace of warmup and cooldown portions of the workout to create added difficulty. And of course the tempo pace itself will increase as well. When I don’t finish, I feel like I’m not accomplishing the purpose of the plan. 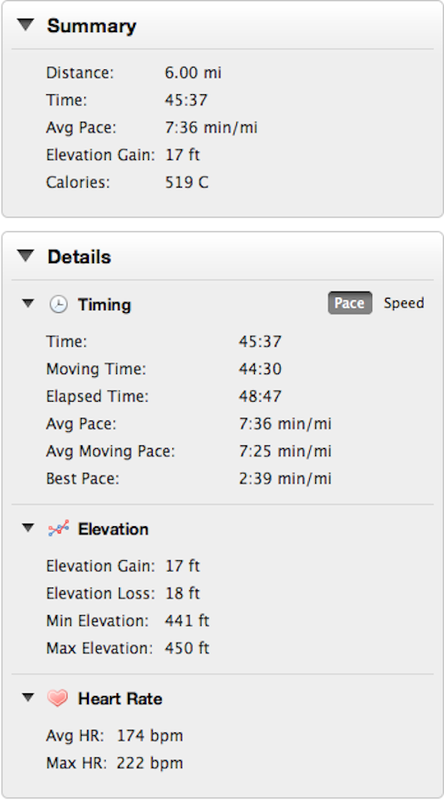 Last, this wasn’t such a bad run… a faster pace was there for me if that were the plan. I am really starting to believe in those painfully slower runs I’m doing on the days where I don’t post. Yesterday, for instance, was 8 miles at about 12:30 pace. 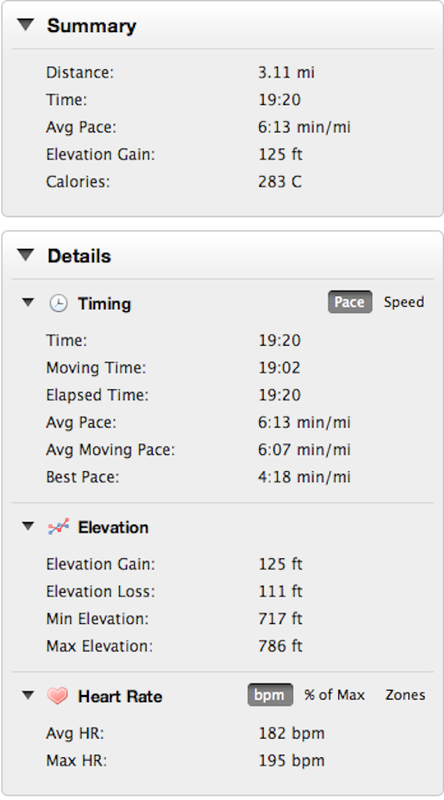 The slowness is in an effort to keep my HR at about 75% or 150 bpm. Often, this means I have to walk. That said, the runs are peaceful; I believe that I’m using fat for fuel at those paces; and I’ve had nothing but good speedier workouts since starting the slow stuff. Tomorrow, 7 miles easy and then speedwork on Thursday. *P.S. 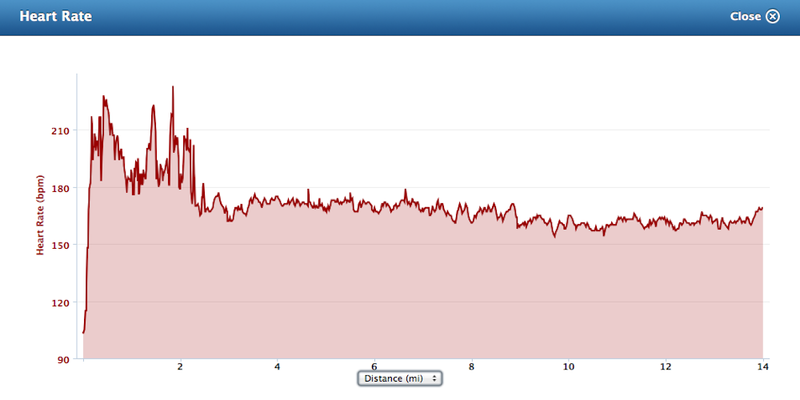 My heart rate didn’t reach 221 (I don’t think). The Garmin graph had me finishing the tempo portion at about 192. Workout: Warm [1 mile], 6×800 @ 2:47 w/ 400 jog Weather: 95 degrees, night. Had a World War I mindset going in. That is, expecting to charge into something and fail. Reading a book on the First World War and the metaphor came to mind. Not to make light of the heroics that took place in Europe by comparing war to running, but there’s something noble about going into a task facing certain doom. I wasn’t expecting much today. Only slept 4 hours last night. Had a long day interviewing and then drove out to the track in 95-degree heat, albeit at night. Hottest run ever for me. I have never recorded doing a run over 90 degrees. With all that in mind, I would have been happy getting through just a couple reps before quitting. And then a good run happened. I knew something was different after the first 800, which just didn’t feel that bad. By the third 800 repeat, I knew that I would finish the 6-rep workout. My only regrets are that I didn’t keep even splits (though I did average 2:47 for the workout as planned), and I cramped in both calves at the end of the workout. Couldn’t finish the cool down and the drills afterwards. HR hit 198 at the end there, and it really didn’t feel so bad.